Previously known as the Elf, the HTC Touch is the next generation in the Taiwanese company's line of Windows Mobile phones. The Touch takes Windows Mobile 6—which is already pretty usable—and integrates what everyone's fawning over the iPhone and the Prada for: finger touching. 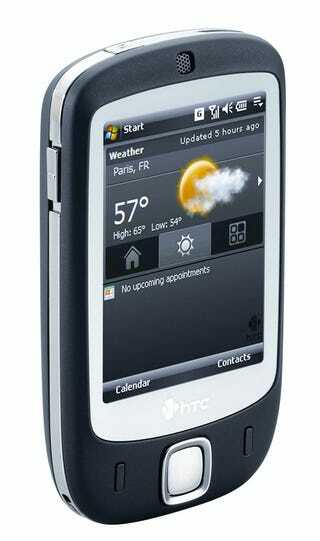 The base OS is still the same Windows Mobile 6, but on top, HTC's added TouchFLO, their own touchscreen app. It can tell whether you're using your stylus or your finger, and if you're using your finger, you can activate a "three-dimensional interface" with "three screens" made up of your contacts, your media, and your apps. It's hard to tell what this involves exactly until we get a hands on, but it sounds like a fancy 3D menu system on the top level that you can spin around by swiping your finger horizontally. In addition, you can use finger swipes to scroll through web pages, documents, messages, and contact lists. There's also a new HTC-styled home screen that replaces the Today screen which lets you access your email, text messages, calendar, contacts, and weather. Now for the specs: 2.8-inch touchscreen at QVGA resolution, 128MB ROM, 64MB RAM, 1GB microSD card (included), 2-megapixel camera, Windows Mobile 6, tri-band GSM/GPRS/EDGE, 802.11b/g, Bluetooth 2.0, and dimensions of 99.9mm x 58mm x 13.9mm (3.9in x 2.2in x 0.5mm). It's also available in two colors, soft black or wasabi. Yes. Wasabi. The Touch is on sale now in the UK and should be available in the US in the second half of '07. Stay tuned for more.